There are many free online training opportunities, and many of them are reasonable experiences. For example, you can watch videos from Stanford on Youtube, and I’m sure other services come to mind. Today I want to recommend Coursera, which I’m pretty impressed with. 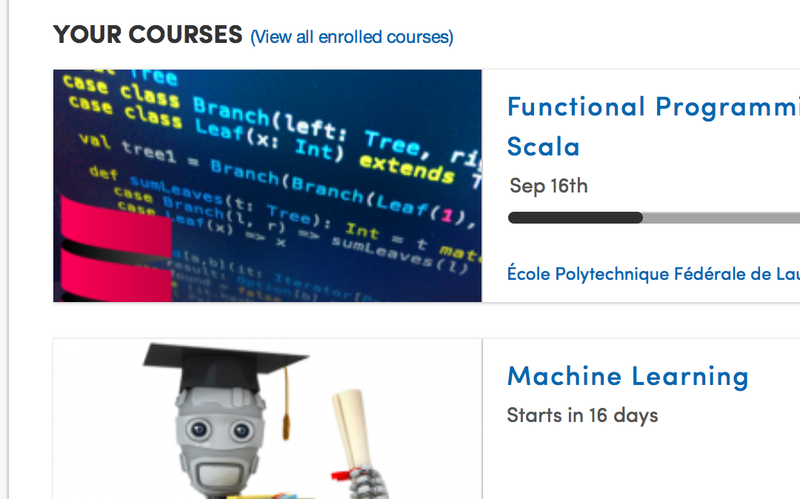 I’m currently taking a class called Functional Programming Principles in Scala, which iss actually taught by the father of Scala, Martin Odersky. It’s a seven-week course where each Monday they open up a new set of video lectures and exercises. The lectures are broken down into 5-6 video segments totaling to about 90 minutes, with pause points where they want you to work something out before it’s shown to you, plus quizzes. I believe this is fairly standard at Coursera. I’m not sure if it’s unique to this particular class, but they have a very nice slide system during the lecture where you see the text, but it’s nicely superimposed over a whiteboard where the instructor can also draw. The weekly programming assignments are well-done and illustrate many principles at once. You’re not only covering the topic of the week, but you’re learning things like how to use sbt (Simple Build Tool) and scalaTest, which are standard build and unit-testing tools in the Scala world. Submission of your programming assignment is actually done via a single command in sbt, and the program is automatically tested and your score posted within about 5 minutes. I’m not sure if other courses live up to this standard, since this is my first, but it’s a great first impression and I can highly recommend it. I’ve already signed up for Machine Learning, which is by Stanford’s Andrew Ng (! ), as well as Data Analysis, Principles of Reactive Programming (Scala and Martin Odersky again), and Discrete Optimization. Obviously, I have a programming/data focus, but the courses cover a wide variety of topics from social networks and economics to biology and the arts. I’m impressed so far, and recommend that you check it out if you haven’t already.